Introducing PointBlank Version 2 Ballistics Software! 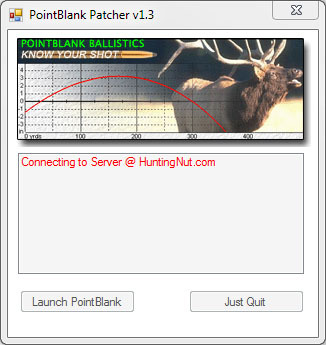 PointBlank is one of the most popular ballistics program on the internet. Completely redesigned in version 2.0, it offers a much easier to use interface with more intuative database organization and many other exciting features! Completely redesigned user interface: PointBlank was completely rewritten from the ground up to offer a much more flexible and easy to use interface. It is now resizable, and data is organized easier via tabs to allow easier navigation. Target info is parented under a specific load. Loads are parented under a specific firearm, firarm under caliber etc etc. This makes for much cleaner organization of reloading notes and other information. One of the most requested features is now included! You can toggle between SAE and Metric units at any time, on the fly. Version 2 now offers a much easier to use comparison chart between different loads. There are more options available now when preforming calculations and viewing data. Max range, range increments etc have been extended per user requests.loads. Included with PointBlank are current data files that contain data for virtually all of the most commonly used components. Still there are times when users have their own custom components. Users can enter their own custom data within the custom data files (bullets_user.slk) via any normal spreadsheet editor. Users are also welcome to submit additional data and it will get added to the primary data source files that then get redistributed to all other uses the next time they run their patcher utility. Printing in prior versions always had issues. With the new version, printing is easy and informative. Print Preview will let you see what is to be printed BEFORE you actually print. Once downloaded, run the PBPatcher.exe program to automatically download the latest program files and data, Internet connection required! The first time the patcher is run, all required files will be downloaded and may take some time depending on internet connection speeds. Running the patcher after the initial first run, will be much faster the majority of the files should not need to be updated. When the patcher update process has completed, you can choose to Launch PointBlank from the patcher. PointBlank has been and always will remain free, however there are increased bandwidth costs associated with the new version. Several users have offered to help support with minor donations to help with website and other costs. If you would like to help support PointBlank, please concider a $10 donation.